This is why we don't do best this or that at the Gathering. How do you judge boats built for different reasons and people. There is no way to compare a boat built knowing it will get fish guts on it to one built for show or to make a child happy. kens wrote: The boats with 5 boards width on the topsides generally gather a lot of attention. The narrower the boards on the topsides or deck, the plainer the grain you want. You have to work with wide boards to let the grain pattern come thru. Thanks. Any examples of boats with 5 boards width on the topsides? I tried to find a photo or example, but no luck. sproggy wrote: And the deck design/caulking is a very obvious design choice that can affect the whole character of the boat and, if executed well, can play a big part in the perceived quality of the boat and workmanship. Thanks. What are the different caulking designs? Thanks all. Definitely not looking for a right or wrong answer. Am interested in opinions. 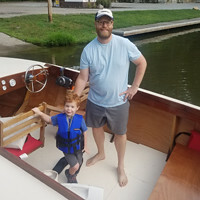 I will be attending a local wooden boat show on June 10, and I want to know more about what to look for before I start building my own. Presently, I in in the "AWE", and "Oooooh" stage with little knowledge of boats and what I am looking at. Does anybody ever encapsulate the parts before they build the frame or attach wood parts? When building furniture or working on my house, I almost always seal or prime wood parts that will be less accessible or inaccessible after construction, and it looks like much of the inside of the hull is less accessible after the construction of the hull. I encapsulated all the frames prior to installing on the building form. That way I could do it while they were laying flat. If you can do it as you go you'll thank yourself​ later. ToddM wrote: What are the different caulking designs? That's not really what I meant - it's more about the overall design of the deck in which caulking plays a part. Board width, contrast in grain/stain/paint between cover boards/king plank and the deck planking, shape of the cover boards and the way they join the king plank (that's a biggie in my book). Caulking can be any number of colours and it can be a number of different materials too. There's a discussion document on the Glen-L site about it somewhere. Best advice is to look at pictures of as many wooden boats as you can and you'll get an idea of what's possible, both for the deck and other features. Then you can form an opinion about how you want your boat to look, whether that's like something else you've seen or completely different. I have done considerable research trying to make my Barrelback as accurate reproduction as possible. Here are my notes as to what was done on the original boats, but then again it is a matter of personal preference. I would highly recommend Don Danenberg's book which is available on Kindle. I am going to use his method of varnishing over the caulk and then painting with a striping machine. most deck planks are 1 3/4" wide. most caulk spaces are 1/8" wide. Apply Caulk apply 1 or 2 coats of varnish then paint over caulk with white boot paint. deck plank width was 1 1/2" wide. All hatch covers have 10 planks per side. Most bow decks have 15 planks per side. For my year boat, the deck planks at the bow come to a point at the bow. The beam between the seats has no planking and caulk. The planking with caulk stops each side at the outer edge of the hatches (see pictures). The king plank width is determined by the sum of the width of the two center hatch planks plus the space between them, in order for the caulk lines to line up with the hatch. The king plank width will be cut to that width rather than say 3 or 4 inches. That determined width will be used for the king plank that is used on the bow. Given: each hatch width is 18"
1/8" x 9 caulk groves =	1 1/8"